If this is an 1850s copy, when would the original 1840s daguerreotype have been taken? The photo is unusual because, judging by the cloaks and the bush in the background it was taken in the winter, but the women have what appear to be new straw hats, normally worn in the summer. 1. If the hats are of British manufacture then this wide-awake style only became popular about June 1847, making this the earliest possible date for the photo.1a. The hats were certainly in Leeds by November 1847, but probably before then in September, when Jenny Lind was touring and concerts in Hull, York and Sheffield were planned. Emily Bronte became ill at the start of October 1848, a week after Branwell's funeral, so this would be the latest date for a photo. The photo was taken outside, probably because of the lack of light or space indoors, but 'Emily' has not removed her hat which would risk obscuring her face; in fact there is just a light shadow cast over her eyes. 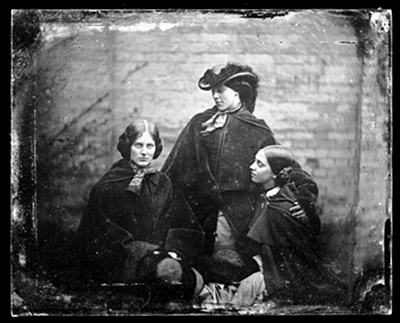 If these are the sisters then the photo may have been taken between December 1847, after all three had become published authors, and about the time when the word daguerreotype first entered Charlotte's vocabulary, in January 1848.2. There are many days in these two months when the sisters whereabouts are unaccounted for.3. Most photos of the 1840s were taken in a daguerreotype studio and there were about ten of these in Yorkshire. The Bradford studio had closed and does not appear to have been operating in the period 1847-8. The studio in Leeds was modern and purpose-built, with a large glazed rooftop studio; there would have been no need to take a photo outdoors in a garden. The most likely location is the daguerreotype studio in Stonegate, York as it was operating and did have a garden to the rear. Bellerby's Public Library & Bookshop, previously used by Branwell and Anne, was opposite, and by January 1848 all three of the sisters' novels were probably on sale there. If a photograph was taken then it is little wonder that there was no mention of it. A great deal of secrecy surrounded the novels which were published using male pseudonyms. The publishers and most readers assumed that the authors were men. The novels were written, proofread and published without even the knowledge of their father, though they were all living under the same roof. Charlotte was very self-conscious about her appearance so it is unlikely that she would want either a photograph or Branwell's portraits of her to be published. She was delighted with her portrait by George Richmond, but comments made by her friends and acquaintances make it clear that this was an idealised portrait. "The little 'Jenny Lind' hats we get 4½d for. I dare say I could make three of them in a day. I never did much of them though; they're for summer wear. Them very large broad brimmed ones as the children wears they get 1s. 9d. for making the finest quality, some 1s.6d., some 1s., and so on. It all depends on the fineness of the plait; the courser the plait is, you know, the less time it will take us to make it." 1a. The same style of hat existed in 1840s Germany when the sisters' friend, Mary Taylor, was teaching there. 2. Letter Charlotte Bronte to G H Lewes; 11 January, 1848. "I had not seen Pride and Prejudice till I read that sentence of yours, and then I got the book. And what did I find? An accurate, daguerreotyped portrait of a commonplace face a carefully-fenced, highly-cultivated garden, with neat borders and delicate flowers; but no glance of a bright, vivid physiognomy, no open country, no fresh air, no blue hill, no bonny beck. I should hardly like to live with her ladies and gentlemen, in their elegant but confined houses."